This Mercedes-AMG E63s is pretty much how I’d option one. Boring but sinister black paint, subtle wheels, and a complete and total lack of carbon fiber accents. Debadge it and only car people would be able to tell the difference between this and a normal black E-Class. The interior is truly what makes this car stand apart from most E63's. It’s tan, not black, and it has wood trim, not the tacky carbon fiber. This is a midsize luxury sedan that weights over 2 tons, no amount of carbon fiber is going to convince me it’s some sports car. 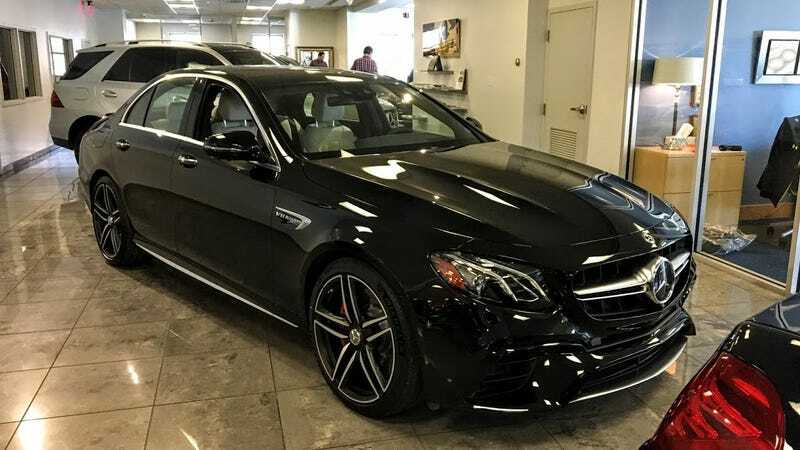 Plus the options this car has almost all ones I’d want: AMG Performance exhaust, Panorama sunroof, massaging seats, heated rear seats, rear side airbags, the AMG Premium package, and the Warmth and Comfort package. Anyone have $116,935 they want to give me? Notice the Special Order charge under the Optional Equipment list. Link to the posting on the dealer’s website here.